Las Vegas: Sin City and the gambling capital of the world. Las Vegas: The entertainment capital of the world. And… ah yes, Las Vegas: the marriage capital of the world. Oftentimes, first time visitors tend to be awe-struck in the beginning by the architecture and design of the city. There are bright lights at night and beautiful hotels such as the Bellagio or Caesar’s Palace, which both offer visitors a luxurious and unique living experience. How do Las Vegas hotels achieve such amazing design? Villas portray beautiful stucco walls and matchless trims. Rooms show off textured walls and faux finishes that could fool any expert. And then, there are the one-of-a-kind features of each hotel. Take for instance the Paris Las Vegas Hotel and it’s replicas of the Eiffel Tower, the Arc de Triomphe, the Paris Opera House, and the hallway at Versailles. 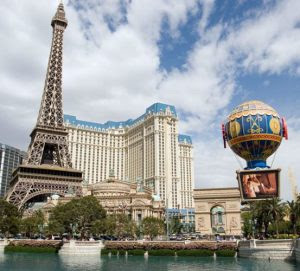 The accuracy of the Paris Las Vegas Hotel’s “Paris Experience” grants their visitors a distinctive and unparalleled encounter (That is, unless the visitors make it out to the real Paris locations!) Is this a benefit for the hotel to have such realistic displays? Of course it is. Many visitors, international or local, are drawn to the artistry of the hotel features. So, if you had the opportunity to deliver the same unique experience to your consumers, would you? Smash Design has the experience and talent to replicate dazzling and radiant designs such as those you may see at the Las Vegas strip. If your company is considering incorporating designs you would see in Las Vegas, whether they be murals, faux finishes, sculptures, or more, we encourage you to seek out Smash Design for your project. We are the team that can make your dreams a reality! Give us a call today and let us make your dream hotel or business come to life.